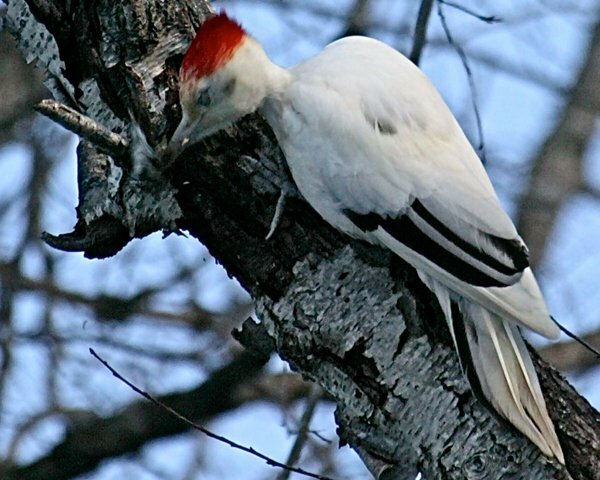 The typical woodpecker, with its coloration of black, white, and red, is ingrained into our brains as birders. We all have our familiar species and we all know our local woodpeckers well enough that a quick glimpse is often all we need to identify them. Because many of our common woodpeckers are such a regular sight we rarely end up taking more than that quick glimpse. After all, who wants to waste time on a boring old bird one can see any day when something shiny and new might be around the next bend in the path? Sure, when we see a new or out of place species or a bird that is both we will ooh and aah over it but if it is a woodpecker that we regularly encounter we willfully ignore it. 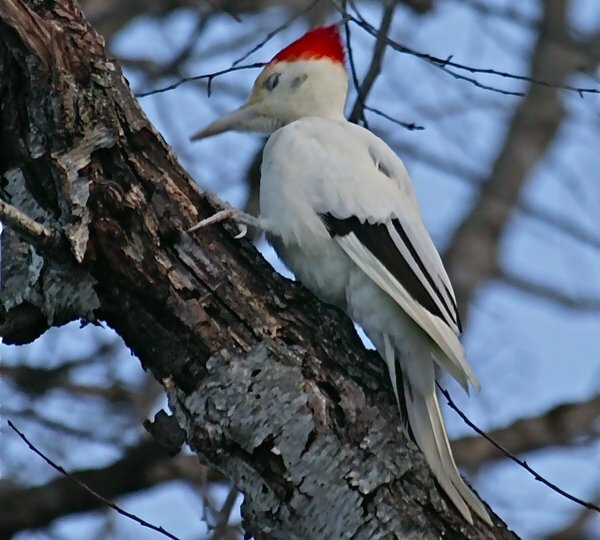 Unless, of course, the regularly encountered woodpecker is somehow different. I found this bird during an early morning of birding and shooting some pics. It was as unexpected as the bird looks! As I said, right place, right time. Can’t describe how I felt when that pileated hopped around to ‘my’ side of the tree! Enjoy the shots that Bill took of this great bird and make sure you keep an eye on your own local woodpeckers! And many thanks to Bill for agreeing to let us share the shots he got on 10,000 Birds…what a woodpecker! If you liked this gallery please check out 10,000 Clicks, our page of great galleries here at 10,000 Birds! Wow! We birders are so focused on color, though it’s often not the most important thing about identification. 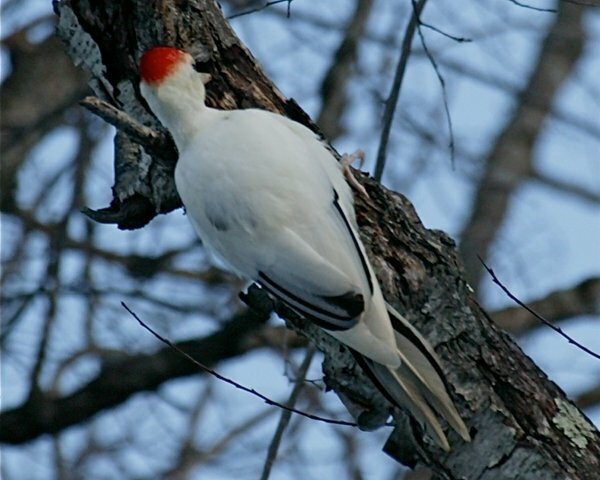 Seeing a large woodpecker with so much white must have been a real Twilight Zone experience! Every bit as exciting as a white tiger! I’ve never seen a Pileated Woodpecker that looks like this. In my entire birding life I have only seen a single luecistic bird and that was an American Robin in North Oakland that I saw like every day for several weeks. These photos are amazing, what a rare experience! Wow! Would love to see this one. Saw a robin once that was half white which was strange but not beautiful like this bird. Wow! That is a seriously cool-looking woodpecker! I see partially albine red-tailed hawks with some level of reglarity, but I’ve never seen a non-RT bird with with much more than a few extra white feathers somewhere. This is outstanding! Truly a wow moment. And Bill had a camera! Thanks for posting these. Last year I photographed an albino House Sparrow [I think] in my yard — saw it around the feeders and trees for several weeks. Photos here, on my mostly-dogs blog. Excuse my language but that is friggin’ amazing. That was an incredible bird… looks so exotic! I bet Bill was just oozing with hope waiting for that Pileated Woodpecker to come around to his side of the tree, hoping it wouldn’t retreat deeper into the woods before he could get a shot off! Wow, what a find. I would have clicked of hundreds of frames of that baby! That is just a magical bird! >Larry, I shot 127 pics to be exact!! I had no idea what I was about to witness when the bird was on the back side of the tree, I just knew it was a pileated by the knocks. It literally took my breath away and I had a brief moment of freezing in my tracks! Amazing! It’s not real common for me to see a “regular” Pileated, what to speak of this. The only leucistic bird I have seen directly (live) what appeared to be a house finch – white all over! Saw a white pileated woodpecker today. Bird was totally white except for red on the head. There was no black at all. I have been birding a long time and this is the first white pileated that I have seen. It was an amazing sight. Wow I love this site and all the amazing people that also love birds!!! 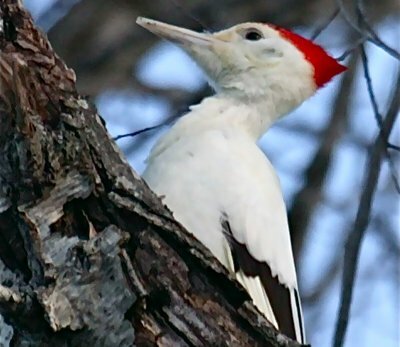 This is the first time I have seen a almost white Pileated woodpecker how unusual. Where I live in Mo there are a few in my woods although they appear to have a large range and are so awesome they are very amazing. I build birdhouses, feed birds and try to plant habitat thank you people for appreciating and praying for all birds they need our help! 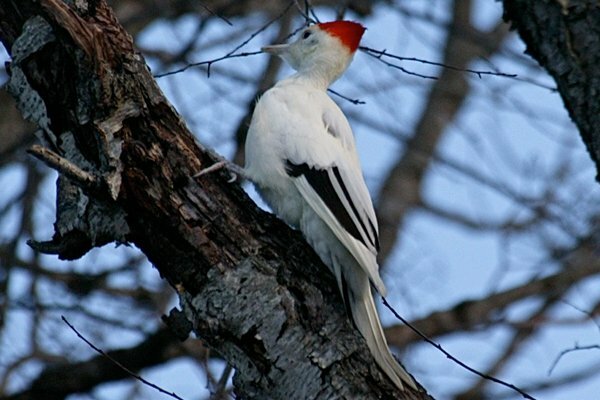 We had a leucistic male pileated here through two full winters, he didn’t have as much white plumage as yours but was wonderful to watch. We were lucky enough to have him coming to our suet feeder and to watch him with his mate and chick. I have many pictures of them all. He dissappeared the second spring but I have been told he could have lost the white colouring in a molt and certainly hope that was the case. We had a rash of leucistic birds in this area that year with a robin, a crow and a downy woodpecker all being photographed with in a short time span. We currently have a female pileated coming to the feeder with a couple small extra white markings but they are few enough I almost question even seeing them. Some years ago my friends and I rented a chalet high up on a mountain so we could just hang out. The chalet we rented was a circular building with a walkway and railing built around the cabin with three sets of double doors for access to the walkway. when the cabin for 8 couples was built they never removed any trees they did not have to take down. So there were tree branches hanging over onto the walkway.